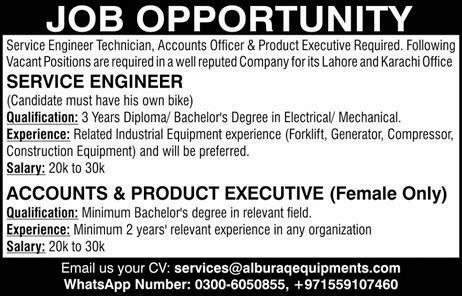 Al-Buraq Equipments (Pvt.) Limited Lahore-Karachi Pakistan. Qualification: 03 Years Diploma/ Bachelors Degree in Electrical/ Mechanical. Experience: Related Industrial Equipment experience (Forklift, Generator, Compressor, Construction Equipment) and will be preferred. Qualification: Minimum Bachelors degree in a relevant field. Experience: Minimum 2 years of relevant experience in any organization.